With warmer weather comes an increase in outdoor activities—swimming, running, and biking, just to name a few. Although the Boston Marathon was held last month, many of the other big ones lie ahead—Chicago, New York, and Leadville—and the season has just started for triathlons and major cycling events. Given the world-wide popularity of these sports, it’s not surprising that many of them have international roots. Here’s a behind-the-language guide to some of your favorite summer sports, and maybe next time when you’re at mile twenty of a marathon or one-third of the way through a triathlon, these histories will give you something to think about and get your mind off the grueling journey. A marathon is a long distance foot race with an official distance of 42.195 km or 26.2 miles. The name is rooted in the legend of Pheidippides, a Greek messenger, who in the fall of 490 BCE was sent from the battlefield of Marathon to Athens to announce the defeat of the Persians in the Battle of Marathon. Interestingly, he was forced to run the route as a messenger after he spent days fighting in the battle. Apparently his commanding officers thought highly of his athletic ability. He managed to run the entire way without stopping until he burst into the assembly and cried out “We have won,” and then collapsed, dead. While the historical accuracy of the legend is questionable, the name stuck for the race which was developed for the 1896 first modern Olympic Games in Athens. A male-only race, the first winner was Spiridon “Spiros” Louis, a Greek water-carrier, and he won with a time of only 2 hours, 58 minutes, and 50 seconds. It wasn’t until 1984 that the women’s marathon was introduced to the Olympic Games and it was won by Joan Benoit of the U.S. with a time of 2 hours, 24 minutes and 52 seconds. Outside of the Olympics, over 500 marathons are organized worldwide with the most prestigious races being the Boston, New York City, Chicago, London, and Berlin races. Decathlons and triathlons are also of Greek origin, decathlon coming from the Greek words for “ten” (δέκα) and “contest” (αθλος), triathlon coming from the Greek words for “tri” (three) and “contest” (αθλος). As the names suggest, the decathlon consists of any ten events, whereas the triathlon consists of three, but while in a triathlon one swims, bikes, and runs, decathlons are centered solely around track and field events. One interesting gender discrepancy is that a decathlon is competed in almost solely by men, whereas women compete in a heptathlon (from the Greek hepta, seven, and athlon, contest). The decathlon developed in ancient Greek pentathlon competitions held at the original Olympic Games. Pentathlons involved five different events—long jump, discus, javelin throw, sprint, and a wrestling match—and evolved after the centuries to become even a religious game. In 393 CE the game was ended by Roman Emperor Theodosius I, but the 1948 Olympics brought it back to the forefront, making the events a 100 m run, long jump, shot put, high jump, 400 m run, 110 m hurdles run, discus, pole vault, javelin, and 1500 m run spread out over a period of two days. The triathlon is thought to be a descendant of the decathlon that holds its beginnings in 1920s France. In France, an annual event called “Les trios sports” or “La Course des Débrouillards” or “La course des Touche à Tout” featured the contemporary combination of swimming, biking, and running with a 3 km run, 12 km bike portion, and a swim across the channel Marne. An earlier tri-sport competition was recorded in 1902 that involved running, cycling, and canoeing, but the traditional triathlon involves swimming over a different sport. The modern triathlon, in it’s many different forms—sprint, Olympic, or Ironman—evolved in the 1970s and today there are hundreds, if not thousands, of triathlons worldwide. Randonneuring is an organized long distance bicycle ride the typically covers between 100 and 1,200 km (60-750 miles). A participant in the ride is called a ranndoneur and the event itself is called a randonnée. Unlike a marathon or decathlon, a randonneuring is not competitive; rather, it is a test of endurance and skill, and riders are expected to carry any gear needed with them—lights, extra clothing, food, etc. A series of “controls” (locations) ensures that the rider follows the designated route, and at each control, information about time of arrival is added to the ranndoneur’s “brevet card” which is then presented to officials at the end of the race as proof of completion. At a “manned control,” someone stamps the card, but at an “info control,” the ranndoneur must answer a specific question about the location to prove that he or she was there. 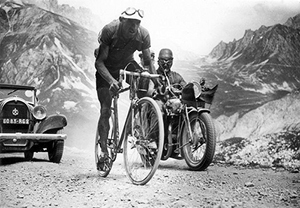 The first randonnée occurred in 1891 and in 1903 the randonnée evolved to include staged races like the Tour de France. Today, the main professional and amateur bike races all evolved from randonnées (except, of course, cash prizes are involved)—Tour de France, Tour of Flanders, Tour of California—but other less well-known non-competitive randonnées occur all over the globe in countries like France, Australia, the Netherlands, Belgium, the U.S., and Canada. Each randonneur is classified by its length. Populaires are rides under 200 km; Brevets are rides of 200 km or more which must be completed within a specific time and date; Permanets or Raids are similar to Brevets but have an arbitrary start date; Fleches involve teams which compete together; and Audax rides are rides of 200 km or more that, like the Fleches, involves a team or riders (but audax rides only occur in parts of France, Holland, and Belgium). With so many different styles and lengths to choose from, it’s no wonder that randonneuring is as popular as it is, especially during these late spring/early summer weeks before the temperatures rise and sweating out practically the equivalent of one’s body weight is the norm.